Research Note: Birth, or Death not found in GRO Index. [S384] Website FamilySearch Internet (http://www.familysearch.org) : Batch C040807. [S949] E-mail from Susan Keefe to Stuart & Teresa Pask dated 2 July 2007: LMA St Leonard's Shoreditch -John Joseph PASK born 1 Mar 1845, baptised 20 Apr 1845 son of James and Mary PASK of James(?) Street, occupation Coffee Roaster. [S1699] Image of the 1851 for 6 Trafalgar Street, Bethnal Green, London: HO107 Piece 1539 Folio 68 Page 28. Enumerated under the name of PARK. [S1517] Image of the 1861 Census for Bethnal Green, London: RG9 Piece 0250 Folio 60 Page 34. [S1120] Image of the 1881 Census for Mile End Old Town, London: RG11 Piece 0480 Folio 22 Page 38. [S359] E-mail from Roger Harvey to Stuart & Teresa Pask dated 15 March 2004. [S3] GRO Indexes to Marriages. "1869/Q4 PASK, John Bethnal Green 1c 678." [S366] Contact through Website Genes Reunited (http://www.genesreunited.co.uk) : Family Tree of Michelle Griffiths. [S66] Website FreeBMD (http://www.freebmd.org.uk) : Marriage cross-referenced 1871/Q2 Shoreditch 1c 257. [S1122] Image of the 1871 Census for 16 Winchester Crescent, St. Matthew, Bethnal Green, London: RG10 Piece 0499 Folio 9 Page 13. Indexed incorrectly under the name of PARK. [S1121] Image of the 1881 Census for Mile End Old Town, London: RG11 Piece 0480 Folio 22 Page 39. [S600] Image of the 1891 Census for Tottenham, Middlesex: RG12 Piece 1069 Folio 58 Page 10. [S332] E-mail from Colleen Morrison to Stuart & Teresa Pask dated 30 December 2003. [S334] Transcript of the 1901 . "PRO Ref RG13 Piece 1246 Folio 79 Page 38." [S3] GRO Indexes to Marriages. "1852/Q3 PASK, James Bethnal Green 1c 753." [S417] Website Ancestry Civil Registration - Marriages: "1852/Q3 PASK, James Bethnal Green 1c 753 = Mary Ann REYNOLDS." [S949] E-mail from Susan Keefe to Stuart & Teresa Pask dated 2 July 2007: LMA St Leonard's Shoreditch - George PASK born 24 Sep 1843, baptised 8 Feb 1844 son of James and Mary PASK of Bath Street, occupation Calico Glazer. [S1498] Letter from Dorothy Pask to Stuart Pask, dated 2005 Family Chart provided by Dorothy PATTEN dated 30 November 1992. [S6] Teresa & Stuart Pask's Guesses, Theories and Speculations: He married Christian AUSTIN in 1861. [S285] Website FamilySearch Internet (http://www.familysearch.org) : Batch No. C040807. [S384] Website FamilySearch Internet (http://www.familysearch.org) : Batch C040808. [S1710] E-mail from Carolyn to Stuart & Teresa Pask dated 5 December 2005. [S1756] Image of the 1851 for St. Mary Whitechapel, London: HO107 Piece 1545 Folio 236 Page 12. Enumerated under the name of PARSH. [S2] GRO Indexes to Births. "1842/Q4 PASK, Mary Frances Whitechapel 2 567." 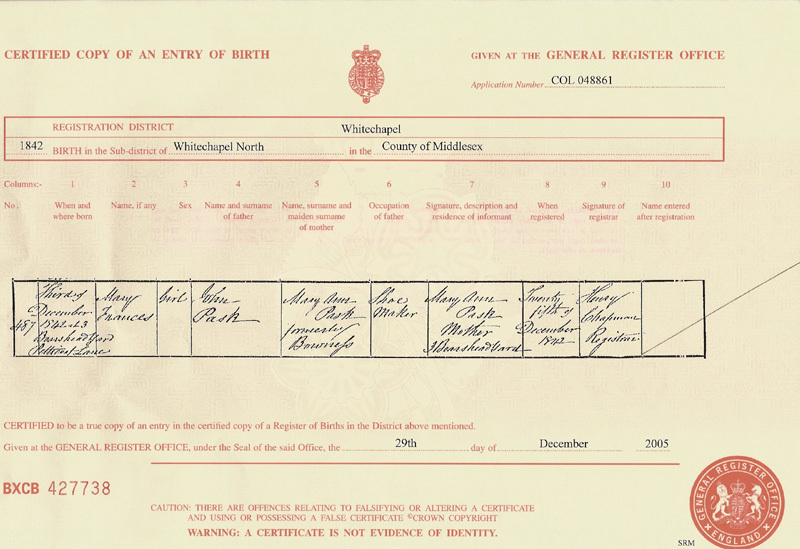 [S1825] Copy of the birth certificate of Mary Frances Pask, born 3 December 1842. [S949] E-mail from Susan Keefe to Stuart & Teresa Pask dated 6 April 2006. [S949] E-mail from Susan Keefe to Stuart & Teresa Pask dated 2 July 2007: LMA St. Mary's Whitechapel - Mary Frances PASK born 3 December 1842, baptised 25 Dec 1842 daughter of John and Mary Ann PASK of Boars Head Yard, occupation Shoemaker. [S384] Website FamilySearch Internet (http://www.familysearch.org) : Batch: C006299. [S2619] Transcript of the marriage of James Bragg and Mary Ann Pask, 16 July 1860. Kindly provided by Howard Benbrook - GOONS Marriage Challenge. [S949] E-mail from Susan Keefe to Stuart & Teresa Pask dated 16 December 2005. [S3] GRO Indexes to Marriages. "1860/Q3 BRAGG, James Whitechapel 1c 743." [S384] Website FamilySearch Internet (http://www.familysearch.org) : Batch M069691. [S3] GRO Indexes to Marriages. "1860/Q3 PASK, Mary Ann Whitechapel 1c 743." [S1736] Image of the 1871 Census for 6 Henage Street, Stepney, London: RG10 Piece 0268 Folio 74 Page 12. [S2620] Transcript of the marriage of James Berry and Elizabeth Pask, 4 September 1865. Kindly provided by Howard Benbrook - GOONS Marriage Challenge. [S1737] Image of the 1871 Census for 23 Widegate Street, Bishopsgate, London: RG10 Piece 0416 Folio 23 Page 40. [S2618] Transcript of the marriage of James Pask and Phoebe Bragg, 2 June 1871. Kindly provided by Howard Benbrook - GOONS Marriage Challenge. [S3] GRO Indexes to Marriages. "1873/Q2 PASK, James = BRAGG, Phoebe Whitechapel 1c 765." [S417] Website Ancestry Civil Registration - Marriages: "1877/Q4 BRAGG, Mary Ann Maidstone 2a 1024 = Thomas CHEESEMAN." [S1739] E-mail from David to Stuart & Teresa Pask. [S1735] Image of the 1881 Census for 23 George Street, Maidstone, Kent: RG11 Piece 0927 Folio 122 Page 32. Enumerated under the name of CHEESMAN. [S1711] Image of the 1891 Census for George Street, Maidstone, Kent: RG12 Piece 0687 Folio 86 Page 18-19. [S4] GRO Indexes to Deaths. "1895/Q1 CHEESEMAN, Mary Ann Maidstone 2a 596 aged 48." [S417] Website Ancestry Civil Registration - Marriages: "1894/4 BRAGG, Mildred Jane Maidstone 2a 1311 = Frank LODER or John WAGHORNE." [S2825] Image of the 1881 Census for 15 Socrates Place, Shoreditch, Middlesex: RG11 Piece 0383 Folio 40 Page 25. [S1518] Image of the 1861 Census for Shoreditch, London: RG9 Piece 0232 Folio 50 Page 45. [S3] GRO Indexes to Marriages. "1869/Q4 PASK, Clara Bethnal Green 1c 691." [S3] GRO Indexes to Marriages. "1869/Q4 PATTEN, George Bethnal Green 1c 691." [S2824] Image of the 1871 Census for 30 Mary Ann Terrace, Bethnal Green, London: RG10 Piece 0495 Folio 107 Page 26. Indexed incorrectly under the name of PATTER. [S2826] Image of the 1891 Census for 3 Old Bethnal Green Road, Bethnal Green, London: RG12 Piece 0260 Folio 4 Page 1. Indexed incorrectly under the name of PATTER. [S2827] Image of the 1901 Census for 3 Old Bethnal Green Road, Bethnal Green, London: RG13 Piece 0283 Folio 16 Page 24. [S366] Contact through Website Genes Reunited (http://www.genesreunited.co.uk) : Dorothy O'Neill's family tree http://www.genesreunited.co.uk/tree.asp. 1849/Q4 PATTEN, George Joseph Whitechapel 2 616." [S384] Website FamilySearch Internet (http://www.familysearch.org) : Batch M132211. 1813 Bury St Edmunds St Mary, Suffolk: PASK, James = ADAMS, Elz. 10 Aug 1813 Bury St. Edmunds St. Mary Suffolk: PASK, James = ADAMS, Elisabeth. [S417] Website Ancestry Civil Registration - Marriages: "1888/Q3 PASK, Clara Risbridge 4a 767 = Elijah COCKERTON." [S3] GRO Indexes to Marriages. "1888/Q3 PASK, Clara = COCKERTON, Elijah Risbridge 4a 767." [S4358] Transcript of the marriage of Elijah Cockerton and Clara Pask, 6 August 1888. Kindly provided by Peter Copsey - GOONS Marriage Challenge. [S1521] Image of the 1891 Census for Flempton, Suffolk: RG12 Piece 1448 Folio 62 Page 11. [S416] Website Ancestry Civil Registration - Deaths: 1891/Q3 Reuben TILLETT Thingoe 4a 344 age 9. [S415] Website Ancestry Civil Registration - Births: 1884/Q4 TILLETT, Ellen May Thingoe 4a 660. [S2] GRO Indexes to Births. "1887/Q4 TILLETT, Clement Thingoe 4a 686." [S1522] Image of the 1901 Census for Hengrave, Suffolk: RG13 Piece 1752 Folio 80 Page 12. RG14PN9057 RG78PN481 RD180 SD1 ED7 SN85." [S123] E-mail from Maria Karg to Stuart & Teresa Pask dated 6 May 2010. [S415] Website Ancestry Civil Registration - Births: 1890/Q2 TILLETT, Leonard George Thingoe 4a 694. RG14PN14477 RG78PN876 RD311 SD3 ED5 SN4." [S415] Website Ancestry Civil Registration - Births: 1893/Q3 TILLETT, Hilda Violet Thingoe 4a 754. [S415] Website Ancestry Civil Registration - Births: 1896/Q3 TILLETT, Albert Victor Thingoe 4a 782. [S3441] Image of the 1911 Census for 6 St. Matthews Road, Ealing, Middlesex: RG14 Piece 10644 Schedule 77. [S415] Website Ancestry Civil Registration - Births: 1899/Q3 TILLETT, Ada Alice Thingoe 4a 844. [S3441] Image of the 1911 Census for 6 St. Matthews Road, Ealing, Middlesex: RG14 Piece 10644 Schedule 77 "Provided by Jeff Flack 5 February 2009." [S415] Website Ancestry Civil Registration - Births: 1897/Q1 KING, Stanley Philip Marylebone 1a 546. [S1523] Image of the 1901 Census for Clerkenwell, London: RG13 Piece 0249 Folio 65 Page 44. [S75] E-mail from Philip Kent to Stuart & Teresa Pask dated 18 May, 2003. [S3430] Image of the 1911 Census for Rutland House, St. George, London: RG14 Piece 6839 Schedule 274. [S415] Website Ancestry Civil Registration - Births: 1899/Q2 KING, Gladys May Marylebone 1a 529. [S4647] E-mail from Angela Ashford to Stuart & Teresa Pask dated 6 August 2013. [S5010] Website London (LMA) Births & Baptisms 1813-1906 Gladys May, daughter of Philip & Mabel King of 137 East Street Buildings, a Police Constable. Born 20 March 1899. [S3431] Online Index to the 1911 census - Alpha Release (Census 1911, http://www.1911census.co.uk) : "RG14PN2941 RG78PN101 RD31 SD1 ED19 SN26." [S2568] E-mail from Rod Ashford to Stuart & Teresa Pask dated 9 May 2007. [S4] GRO Indexes to Deaths. "1923/Q1 ASHFORD, Alfred A. = KING, Gladys M. Wandsworth 1d 643." [S4] GRO Indexes to Deaths. "1959/Q3 ASHFORD, Alfred A. Surrey Mid Eastern 5G 188 aged 63." [S4] GRO Indexes to Deaths. "1978/Q1 ASHFORD, Gladys May 20 March 1899 Eastbourne 18 0643." [S2568] E-mail from Rod Ashford to Stuart & Teresa Pask dated 7 May 2007. [S2] GRO Indexes to Births. "1928/Q4 ASHFORD, Byran A. KING Wandsworth 1d 750." [S2568] E-mail from Rod Ashford to Stuart & Teresa Pask dated 3 August 2007. [S1524] Image of the 1871 Census for Kirkby Mallory, Leicestershire: RG10 Piece 3240 Folio 13 Page 19. [S415] Website Ancestry Civil Registration - Births: 1862/Q1 ELLIS, George Thingoe 4a 445. [S415] Website Ancestry Civil Registration - Births: 1864/Q2 ELLIS, Ellen Market Bosworth 7a 69. [S1528] Website The Hodge Family of England (http://www.tribalpages.com/tribes/dh9183).